Videos are a way to enhance the user engagement of your website. Many people like to watch a video rather than reading a blog post. Many kinds of blogs are more dependent on videos like travel blogs or video blogger. However, every blog or website uses video once in a while. Videos can also help you distinguish your blog in the same niche from others. Video hosting sites like YouTube, Vimeo, Facebook, Twitter and many others are super easily incorporated by WordPress. In this guide, we will show how to easily include video posts, pages and sidebar widgets in the WordPress blog. From YouTube, check below the video and look for a button that says Share, right above the red Subscribe button. 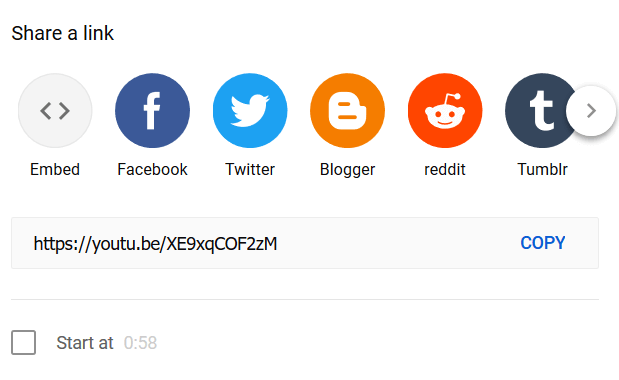 Click on Share, and a new menu will pop up. Below the link, there is an option “Start”. You can tick start at check box. It allows you to start a video in a specific time frame). This option allows you to change the size of the video. You can adjust the height and width of the video. This is it. Your video will be shown in the post. WordPress can only do auto-embeds for white-listed video services. You’re still going to have to get the embed code for other websites and then add it to your blog posts.